This is an extraordinary large plate by Maria Martinez and her husband, Julian. Maria would make the pottery and Julian would paint the design. 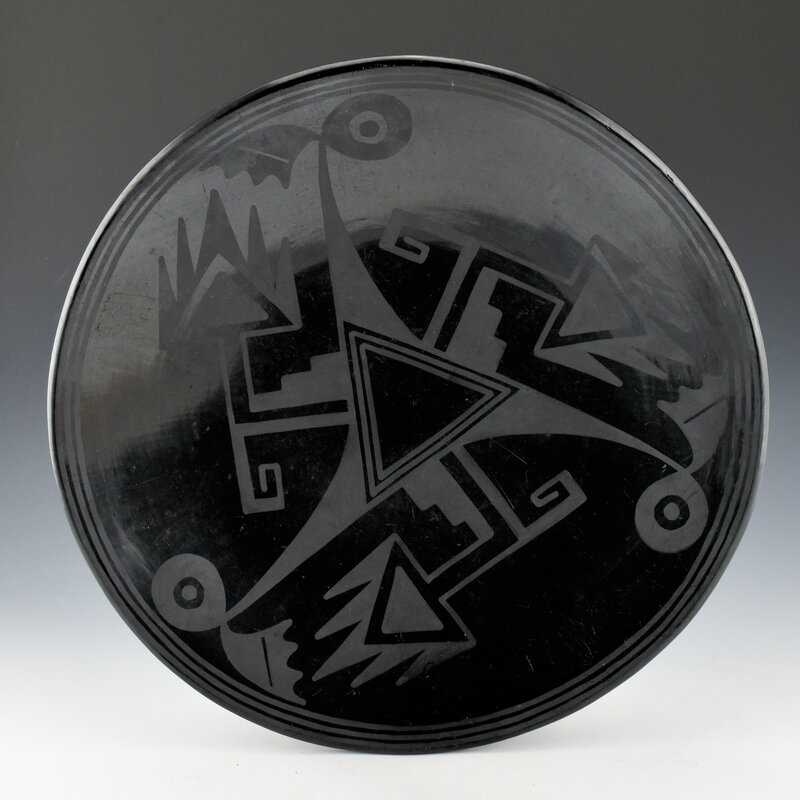 The unique aspects of this piece are the size and the design. 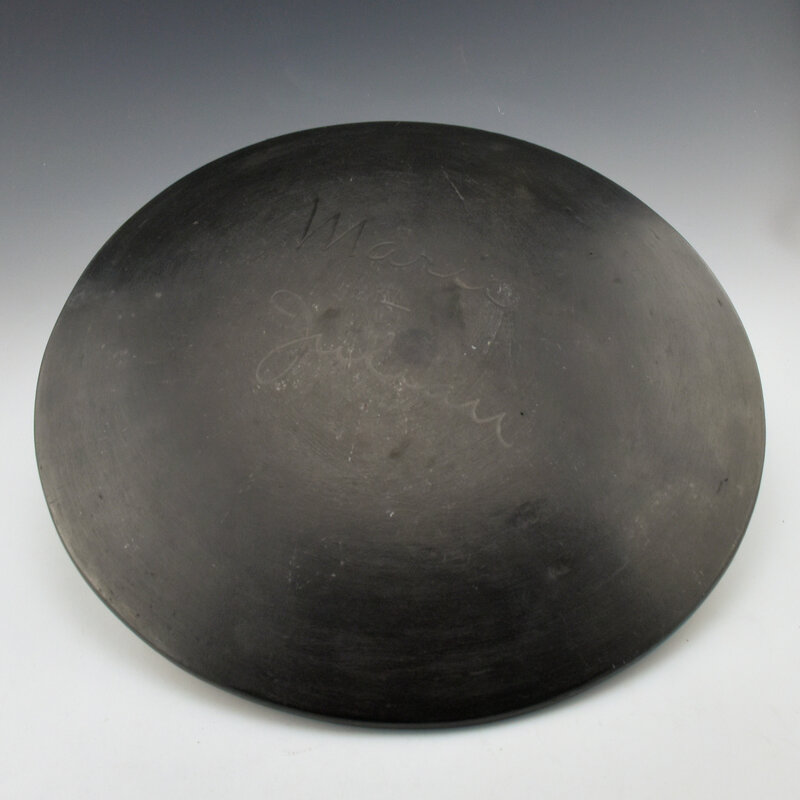 Many of their early plates were under 12″ diameter, as they were less likely to break in the firing. 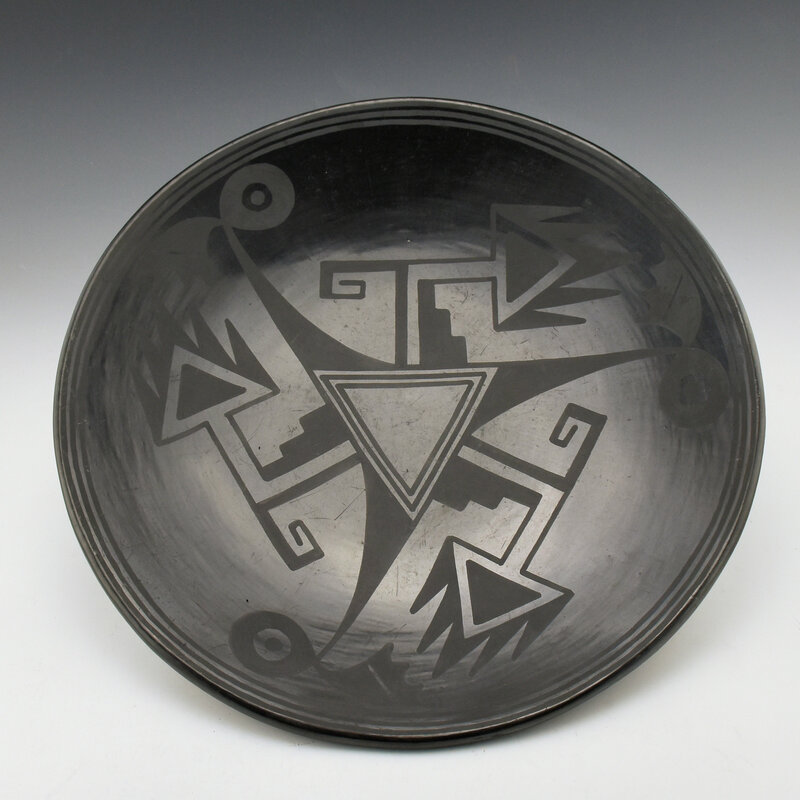 As well, this design is one which is an early pattern and one which was very rarely used in their pottery. The design is a series of three San Ildefonso birds. The heads are near the rim and the wings are extending backwards with the triangle in the center making up their legs. However, as a whole pattern, it has a beautiful flow and dynamic appearance. 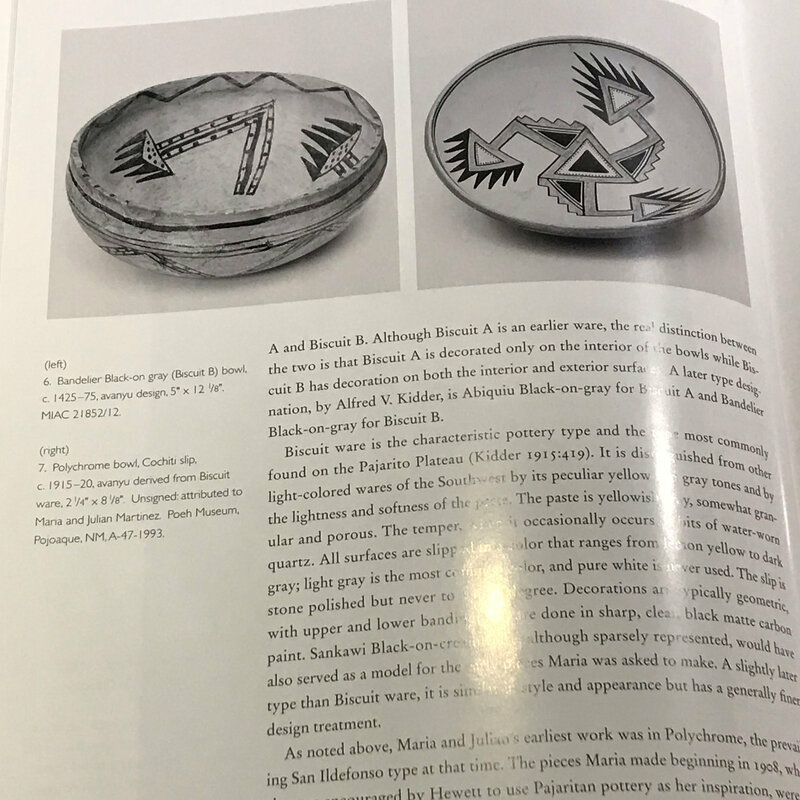 The “wings” on this piece are a design which in Richard Spivey’s book, “The Legacy of Maria Poveka Martinez”, it is identified as an “avanyu” (see last photo). 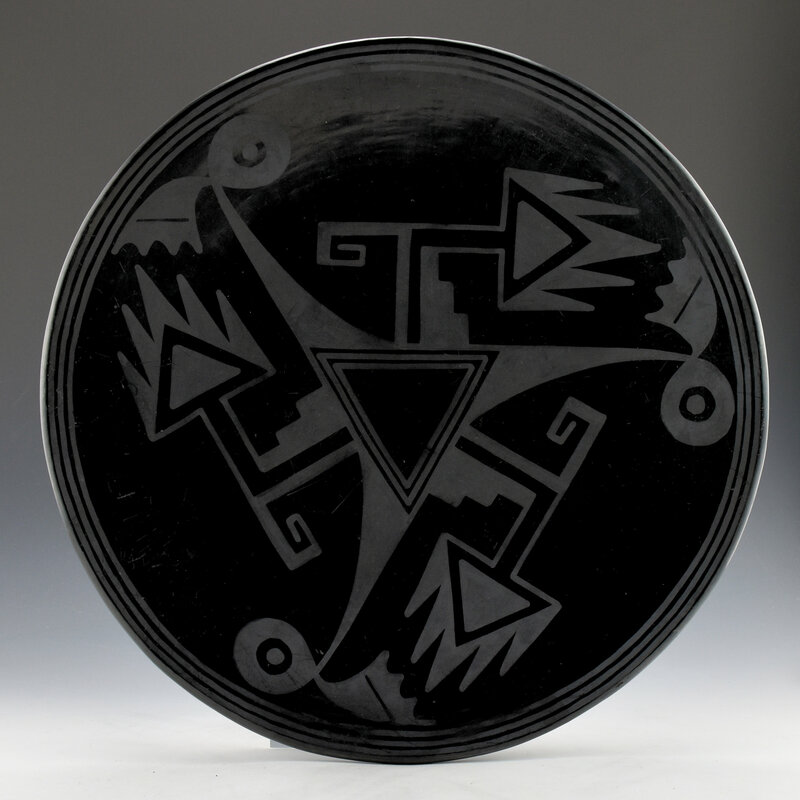 However, I spoke at length with a San Ildefonso potter about this particular design and he explained how it was a bird and that it is a design often seen around the Pueblo. To have his input gives an important addition of cultural knowledge about these pieces! As for the plate, it is in good condition with no chips, cracks, restoration or repair. There are some light surface scratches which are not unexpected in a piece from this time period. The plate is signed on the back in the clay, “Marie + Julian”. In terms of the photos, I tried to take them at different angles and different lighting to reveal both design and condition. The curve of the plate makes it difficult but I think if you view the various photos it is possible to have a good idea of the overall condition. 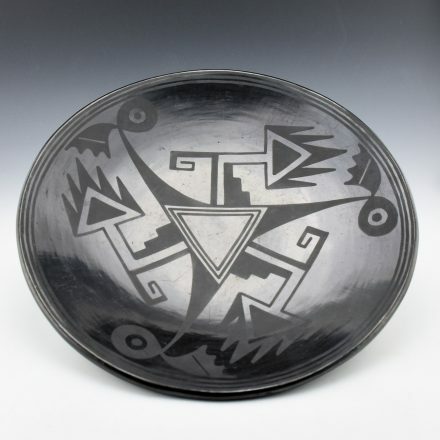 This is definitely one of those exciting pieces by Maria & Julian Martinez which rarely come around to the marketplace!